The University of Oregon School of Music and Dance events calendar is packed full of performances – from a visiting flutist, to baroque chamber music, to the world premiere of an original opera. The UO School of Music and Dance is located in the Frohnmayer Music Building on the UO campus, 961 E. 18th Ave, Eugene. For more information or for a complete calendar of events, call 541-346-5678 or visit music.uoregon.edu. Flutist James Hall has enjoyed a varied and impressive career as an international soloist, chamber and orchestral musician, and teacher. Hall has been the winner of numerous competitions, including New York’s Artists International, St. Louis’ Artist Presentation Society, and the Kansas City Musical Club. This past summer, he appeared as a soloist with the National Symphony of Paraguay and the Paraguayan National Conservatory Chamber Orchestra, and will tour South Africa in recital with pianist Stephen Pierce this spring. Tickets are available at the door or in advance from the UO Ticket Office, 541-346-4363. The UO's annual faculty dance concert will feature UO dance students in works by members of the UO dance faculty and by guest artist and renowned choreographer Mark Haim, recipient of a Boekelheide UO Creativity Award for 2012-13. Tickets are available at the door or in advance from the UO Ticket Office, 541-346-4363. The world premiere of a new work by composer Ethan Gans-Morse and librettist Tiziana DellaRovere, "The Canticle of the Black Madonna" is a completely original work that seamlessly blends modern opera and classical oratorio. Featuring powerful music, intricate fine arts, masks and costumes, live ritual, and elements of classical theater, the opera-oratorio is an immersive musical work for six operatic soloists, chorus, and chamber orchestra. Set in Louisiana during the 2010 oil spill, "The Canticle of the Black Madonna" is the story of Adam, an American soldier recently returned from combat in Afghanistan, and his wife Mara, an oyster farm manager and animal rescue worker. The story centers on Adam’s struggle with Post-Traumatic Stress Disorder (PTSD), Mara’ s torment as she copes with her husband’s violent outbursts and the environmental effects of the spill, and their encounter with an otherworldly power of sacred healing and redemption that will leave both characters changed forever. More information: http://canticleoftheblackmadonna.com. Audience members are invited to a free pre-concert “Musical Insights” talk at 2:10 p.m., delivered by UO graduate student Eliot Grasso. Directed by extraordinary violinist Monica Huggett, this ensemble of soloists from the Portland Baroque Orchestra explores the world of “The Viennese Bass” in period instrument style. Guest artist Chi-chi Nwanoku of London appears as soloist with many prestigious European ensembles, and is principal double bass and a founding member of the Orchestra of the Age of Enlightenment. The concert will include Mozart's Divertimento in D Major K. 136; Vanhal's Divertimento in G Major for violin, viola, and double bass; Dragonetti's Bass Quintet No. 18; Haydn's Divertimento in C Major Hob. II:C5; and Boccherini's "La musica notturna delle strade di Madrid" Op. 30, No. 6. Tickets are available in advance from the Hult Center 541-682-5000 or the UO Ticket Office 541-346-4363. Students from the flute studio of Molly Barth will perform chamber works of Bela Bartok, Jennifer Higdon, Jan Bach, and UO student composer Matt Zavortink. Tickets are available at the door or in advance from the UO Ticket Office, 541-346-4363. A concert in the annual series featuring singers in the Vocal Studies program at the UO School of Music and Dance. Professor Boris Berman of Yale University, a world-renowned Prokofiev specialist who recorded all Prokofiev piano works and wrote a book on Prokofiev's piano sonatas, will join the piano studio of Alexandre Dossin via digital connection for a two-hour master class to discuss Prokofiev's sonatas. Complete list of repertoire and performers: http://bit.ly/uoregonprokofievsonatas. Public Lecture: Jaap Schröder, Violin, "A Lifetime of String Quartet Playing"
A presentation by the THEME colloquium, co-sponsored by the Oregon Humanities Center. 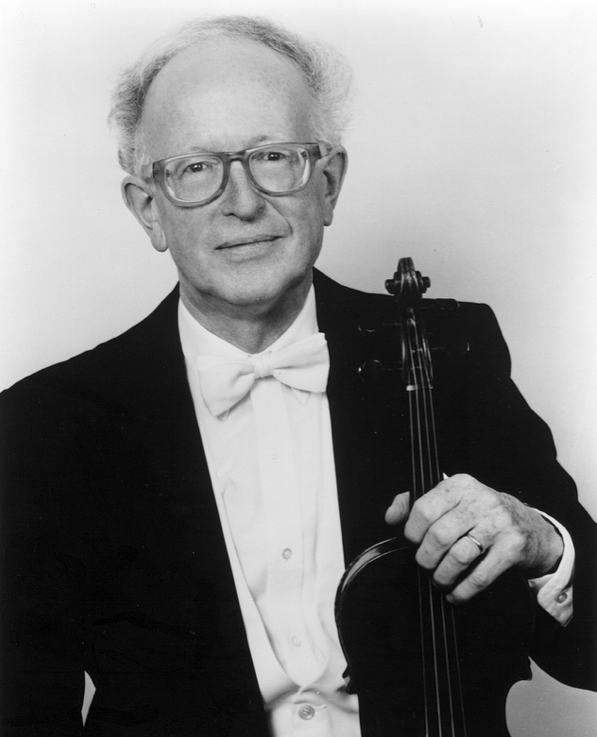 Violinist Jaap Schröder began his career as a second violinist with the Netherlands String Quartet in the mid-1950s and toured Europe and the US between 1958 and 1968. His pioneering work as a baroque violinist began in 1960. In the early 1970s he founded the first period string quartet in Amsterdam, the Esterházy String Quartet. His next group, the Smithson String Quartet, was founded in the 1980s, and was based in Washington D.C. He currently he performs with the Skalholt String Quartet in Iceland. With these four ensembles Mr. Schröder has recorded much of the standard classical string quartet repertoire of Haydn, Mozart, Boccherini, and Schubert, as well as the works of many lesser-known composers. In his talk, he will tell us about his experiences during his 60-year long career as a violinist, and about the excitement of recreating string quartets of the past that had, until recently, virtually been forgotten. Founded by Professor Steve Larson at the University of Oregon, THEME is an interdisciplinary colloquium of faculty and student researchers in music theory (T), musicology/music history (H), ethnomusicology (E), and music education (ME). Students in the UO’s Jazz Studies program will perform in a variety of jazz combos. UO Gospel Singers Benefit Concert "Reaching Out"
Andiel Brown, director. The UO Gospel Singers perform a fundraising concert to cover expenses for their upcoming trip to China in March. The Oregon String Quartet continues its ambitious performance cycle of all 17 of Beethoven's string quartets. This concert features the fiery Quartet in F Minor, Op. 95; and Quartet in B-flat Major, Op. 130, which contains the sublime "Cavatina," one of Beethoven's masterpieces. More information: music.uoregon.edu/osq. Tickets are available at the door or in advance from the UO Ticket Office, 541-346-4363. A performance by the students of the UO Trombone Choir under the direction of Henry Henniger, joined by special guests the Rose City Trombones. Repertoire will include Humperdinck's "Children’s Prayer," Rachmaninoff's Prelude in C# minor, Ewazen's "Posaunenestadt," and Dibb's "Provence." The UO's Jazz Ensembles present their annual winter concert, featuring world-renowned saxophonist Seamus Blake performing with the Oregon Jazz Ensemble and Jazz Lab Band II. Tickets are available at the door or in advance from the UO Ticket Office, 541-346-4363. Part of the biannual Music Today Festival. The Ova Novi Ensemble, the UO women's music ensemble, will perform new works as part of the biannual Music Today Festival. Intriguing programs of great beauty and breadth have distinguished the PRISM Quartet as one of America's foremost chamber ensembles. PRISM features music by UO composers and is part of the biannual Music Today Festival, as well as the Vanguard Workshop Series for new and emerging artists. The members of PRISM are Matthew Levy, Timothy McAllister, Zach Shemon, and Taimur Sullivan. Eric Wiltshire, director. Tickets are available at the door or in advance from the UO Ticket Office, 541-346-4363.